Big thanks to artist Chip Skelton for showing us all how it’s done! Sadly, Chip claims (CLAIMS!) this is possibly his last comic page… ever. Like me, he’s much more interested in writing and will be focusing his energies in that direction. Best of luck, Chip. That can be a rewarding–and frustrating–experience. BUT, this isn’t the last you’ve heard from Chip as far as The SuperFogeys goes. As owners of SF Vol. 1 well know, Chip drew up a 12(!) page story for me years ago featuring Captain Spectacular, Spy Gal, Dr. Rocket, The Thrice Evil and a young team of superheroes known as… The Unicef Upstarts. One day, I’ll post that story here. You will shine again, Chip! Speaking of stories from SF Vol. 1 that you might be interested in seeing, next week my plan is put my collaboration with Lucas Turnbloom, “The Audition,” online for your reading enjoyment. Those of you that have read it know it’s a key moment in SuperFogeys history… though Lucas had no idea of that at the time he drew it! How does that work, exactly? You’ll find out. 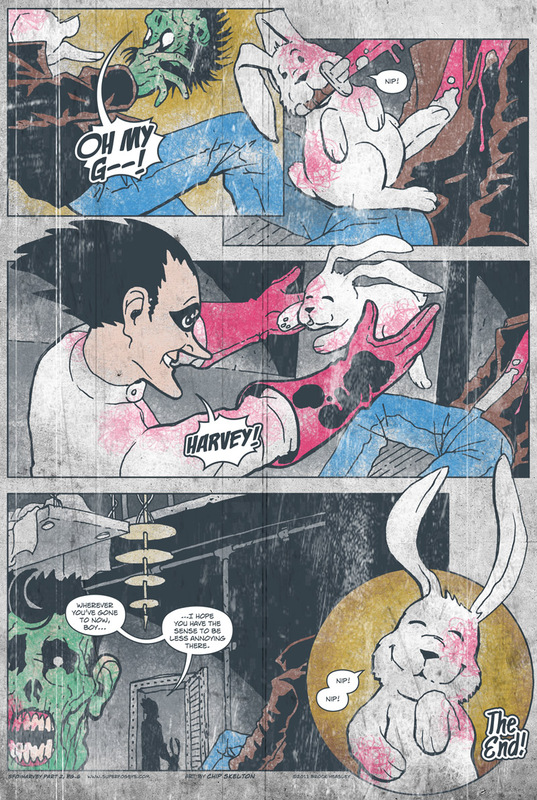 Harvey is one happy Zombunny! And you thought the Miner Zombie was bad…. Harvey’s so cute! And now Jimmy can rest in peace! This was a very happy ending! @Valareos — Actually it’s more like the plants have a new weapon against the zombies. I don’t think Harvey’s into a vegetarian diet anymore. I’m sad to hear that Chip is finished. I really enjoyed his art, especially in Broken.